After a week or so of miserable rain, we decided to give the coast a break and venture a little ‘in land’. A 3-hour drive through miles of vineyards eventually led us to a dirt track in the middle of nowhere. High above us, forest trees loomed over on both sides. When it looked almost certain we were lost (again), the slightest glimpse of an old faded and weather-beaten sign said ‘Du Vieux Chateau’…our intended destination. As Colin meandered ungracefully through the rutted track, kicking up a storm of dust behind us, our spirits faded with every bump, clatter and clang. Surely, this cannot be the ‘Delightful Wooded Castle Park’ the guidebook suggested? Our eyes were first drawn to an old German WW2 wagon, converted into a makeshift home for a bearded man, and then the campsite ‘Reception’ – a shabby caravan, sitting amongst the debris of fallen tree branches. The sign said FERME (Closed). As we considered our options, the warm wind shook the trees high above us, bringing down further branches…and that’s when we saw it – A magnificent castle, perched high on the hillside, watching protectively over the campsite. Not a stone’s throw away. 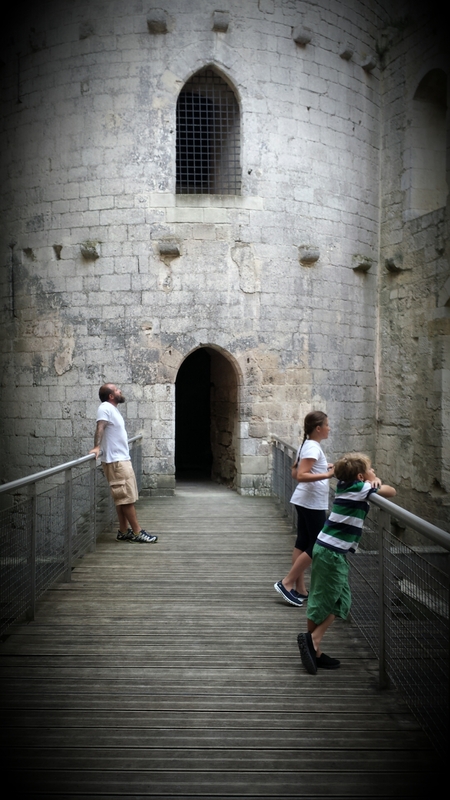 The sight of the 12th Century ruin decided it – we were staying. What was initially viewed as ‘Hillbilly hell’ quickly changed to ‘rustic charm’. We pitched up in record time and instantly marched towards a gate that led to a dozen steep gravelled steps ascending to the foot of the castle. Its sheer height dwarfed us. We made our way around its exterior walls to the vast entrance gates that would have once housed a draw bridge. Inside the ruin a number of strategically placed plaques shed light on the history of the castle, from its original order by the British Monarch to its use as a German armoury in the Second World War. 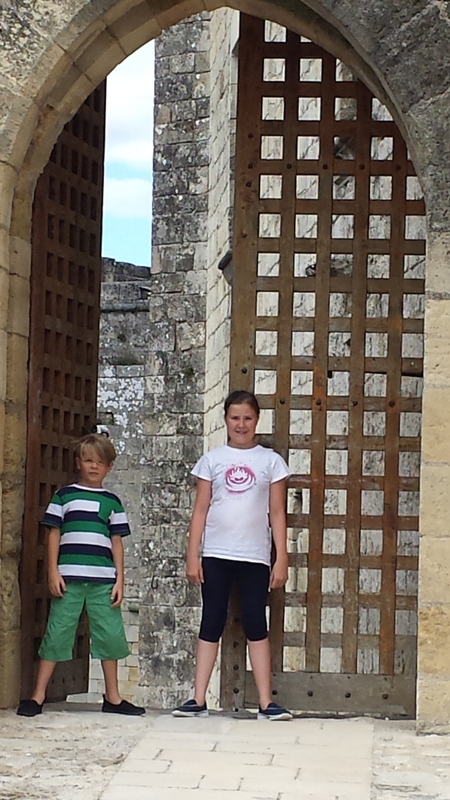 The kids listened to stories of the Hundred Year War, how skilled Archers defended the castle and how clever designs kept the enemy out. They added their own theories, asked questions and offered credible answers; their enthusiasm increasing with every snippet of new information. The culmination of their exhilaration came in a treacherous (by my standards) 80ft climb up a pitch black, narrow spiral staircase leading to an open air turret. With every tentative upward step, my knees turned to jelly. I lost count of the times I cursed under my breath. At the top, we were received by a rush of howling wind that whisked my hair into a frenzy. Within seconds heavy rain fell, followed by a long rumble of thunder and the loud strike of lightening. The kids cheered, hands held high, challenging Mother Nature to do her best. It was a memorable moment – but one only a nerve-stricken mother could ruin…I needed their feet firmly back on the ground! Safely back at the campsite, wet and wind-swept, we learnt that Rauzan was not only host to this splendid castle but also a 3km cave and a subterranean river that flows under its village. The next day’s excursion was booked. 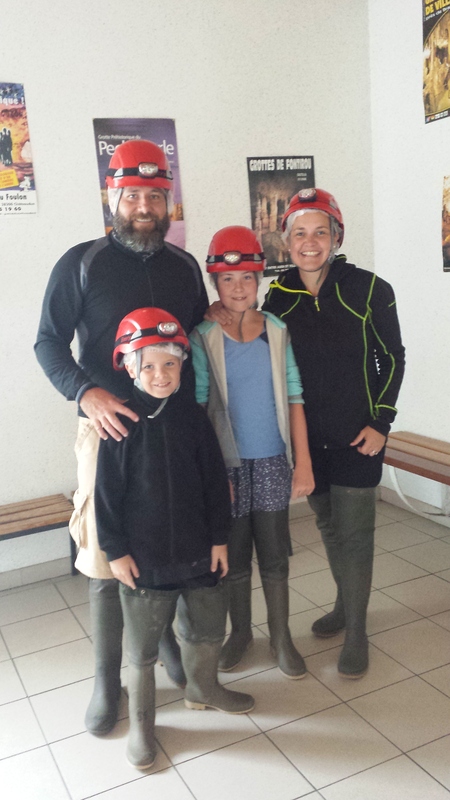 Suited and booted in our hard hats, torches and waders, this time we descended 80 steps underground to the sound of trickling water. As we reached the bottom, our eyes fixated on impressive stalactites and stalagmites that were a mere 10,000 years old (apparently the cave is very young at just 20,000 years old). A Victorian Shopkeeper had discovered the cave after digging for a well so that he could sell water to his customers. On finding the cave he quickly realised its potential. In an amazing feat, he installed over 80 granite stones to create a spiral stairwell which would enable paying visitors to take tours; offered by his two young shop assistants. For years, these two ladies guided hundreds of visitors through the hazardous cave with only candles, wooden shoes and long heavy cotton dresses. With no regard for the cave’s history or time it takes for a stalagmite or stalactite to grow (just 3mm to 8mm every 100 years), the Shopkeeper hacked them down and sold them as expensive souvenirs, until he made enough money to retire. He sold the shop and for the next 70 years the cave was covered up and forgotten about by its cantankerous new owner. But the Town Council never forgot about its existence. When the old man died, they approached the new occupier (an elderly Grandmother) and asked if they could access the cave to research it and prepare it for public access. For four years, the old lady permitted dozens of professional’s access to the cave through her bedroom, until they were able to open a new entry point. She died before the caves were opened to the public but as an appreciation of her patience and kindness they named the cave after her – The Celestine Cave. After Rauzan we developed a thirst for medieval villages and decided to drive further inland to a small village called Pujols. It was said to be the prettiest village in France. Our guidebook said our campsite was ‘at the foot of the medieval village of Pujols’ so we were mildly surprised to see a mountain-sized hill between us and the village. The only way up was to walk. An 800ft ascent later, and purple from exhaustion (Lola and I are so unfit! ), we arrived outside of the walled village. We had great expectations and we were not disappointed. The parish houses tiny cottages with original beams and little lead windows – now adorning beautiful hanging flower baskets. The church bell rang out to welcome midday, as the trinket shops closed up for an extended lunch. 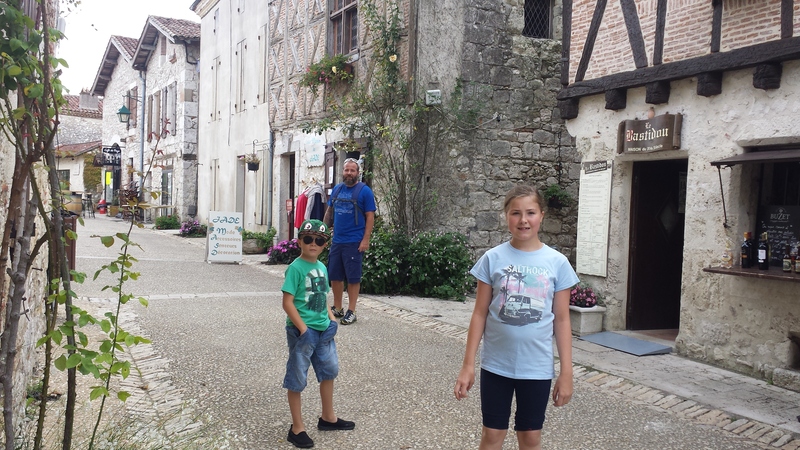 We enjoyed the benefit of exploring the small village without the interruption of tourists. We arrived at the open market square at the same time as a wedding party carrying a stream of pink and white balloons, ready to decorate the small square for the arrival of the bride and groom. 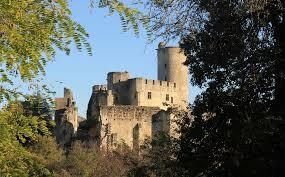 Deciding to leave them in peace, we ambled back down the hill towards Villeneuve Sur Lot – another walled town 3km away. 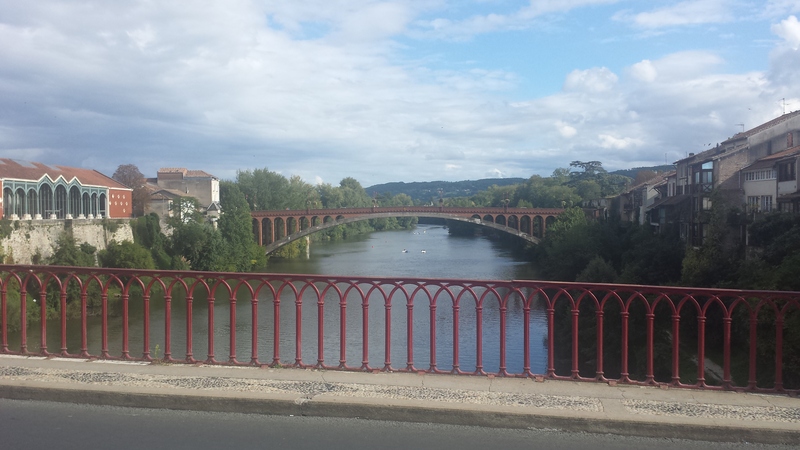 This time, the river was the highlight, with an impressive red bridge that arched over a wide stretch of tranquil water and a handful of rowers and peddlers. The plaza’s fountain also provided the kids with an opportunity to cool down and listen to some live street entertainment. We arrived back to our rather ordinary campsite (following our favourite rustic one) aching but happy with our 19,000 steps achieved. As Chris and I prepared our evening meal, Jonah ran to play at the park. Five minutes later he returned with a pink balloon. The very balloon we had seen escape from the bridal party some hours earlier. As he played on the swing, the balloon had lightly touched his head. Jonah was delighted that the balloon must have found its way out of the walled village, down the hillside and across neighbouring farmland, only to arrive at his feet. His smile was infectious. Who would have thought a balloon could bring such joy. 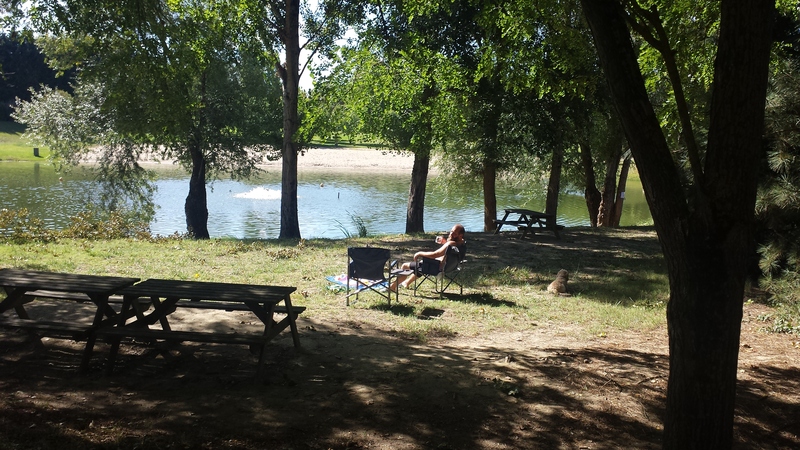 We left Pujols very satisfied and headed back towards the coast, stopping at an Aire with an ‘on the spot’ lake. Little did we know how fortunate we would be when we arrived at a beautiful location – with a marina full of barges and pleasure boats, a beach-lake and a 30km canal. The sun blessed us and we enjoyed our days cycling along the canal, swimming in the lake, fishing with a net (unsuccessfully) and painting. I feel very fortunate that our last week has included medieval castles, ancient walled towns, subterranean caves, elegant bridges and lazy canals. But the memories that I will hold sacred are not necessarily or singularly the grand experiences but also the little things…the moments that cost nothing but count for everything. Our neighbour in Cornwall recently spoke about the importance of time, and how lucky we are as a family to have this opportunity to make up for lost time (see previous blog). I don’t think I really appreciated how lucky we are until this week. We really are privileged to have this unrestricted time together as a family. The little things are so important; as these form the memories of our children’s future. Next A Turning Point….And A Right Turn!